Author Melanie Atkins has a new book – Quest For Justice! 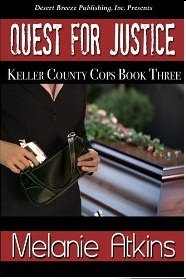 Romantic mystery writer Melanie Atkins has released her latest book – Quest For Justice! A grief stricken detective takes a suicide assignment to avenge the death of the man she loves, only to discover things aren’t always what they seem—and that she very much wants to live. Abby Ryals goes behind the sheriff’s back to accept an undercover assignment with another agency so she can avenge fellow detective C.J. Bowman’s death, and is stunned to learn he’s very much alive when he leaves witness protection and follows her undercover to keep her safe. Together, they race the clock to defeat a notorious drug lord before he discovers their true identities. Melanie Atkins a multi-published author of romantic suspense, a fan of crime dramas, and an avid reader. Writing is more than an escape for her—it’s a way of life. She grew up in the Deep South listening to tall tales and penning stories about her cats. Now she writes gripping stories of love, suspense, and mystery with the help of her furry little feline muses. Atkins has several books to her credit. From the New Orleans Detective books, to the Wicked books, to the single release Flash Bang, and now the Keller County Cop books. Visit her website at MelanieAtkins.com! Melanie Atkins a multi-published author of romantic suspense, an editor for an online publishing company, and an avid reader. Writing is more than an escape for her—it’s a way of life. She grew up in the Deep South listening to tall tales and penning stories about her cats. Now she writes gripping stories of love, suspense, and mystery with the help of her furry little feline muses. Melanie is an active member of Romance Writers of America®, the Magnolia State Romance Writers (MSRW), the Published Author Network (PAN), the Electronic and Small Press Authors’ Network (ESPAN), the Electronically Published Internet Connection (EPIC), Sisters in Crime (SinC), the Red Dog Writers, the Gulf Coast Writers Association, the Southern Writers, the Mississippi Authors Guild and the Byram Writers’ Group. She currently serves as Past President of MSRW.